Saturday - We finished the week with a shorter ride, though it wasn't really any easier than previous days with a lot of rolling hills. 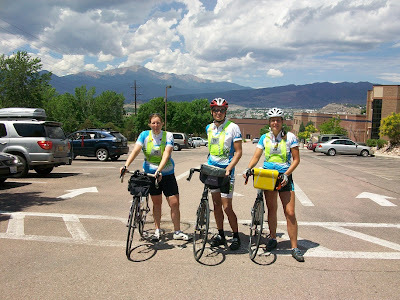 However, a number of the really strong cyclists finished the ride early so they could ride up Pikes Peak, which is over 14000 feet above sea level, 8400 feet over Colorado Springs. They endured rain, hail, thunder and lightning, freezing cold, exhaustion, and elevation sickness, but five guys made it to the top including Marc and Joel, who I've ridden with and played euchre with (see photo from Day 12). They each had a donut at the donut shop at the peak, but needed to hitch a ride down the mountain with two other cyclists who had driven up because the road was too slippery and unsafe to ride down. 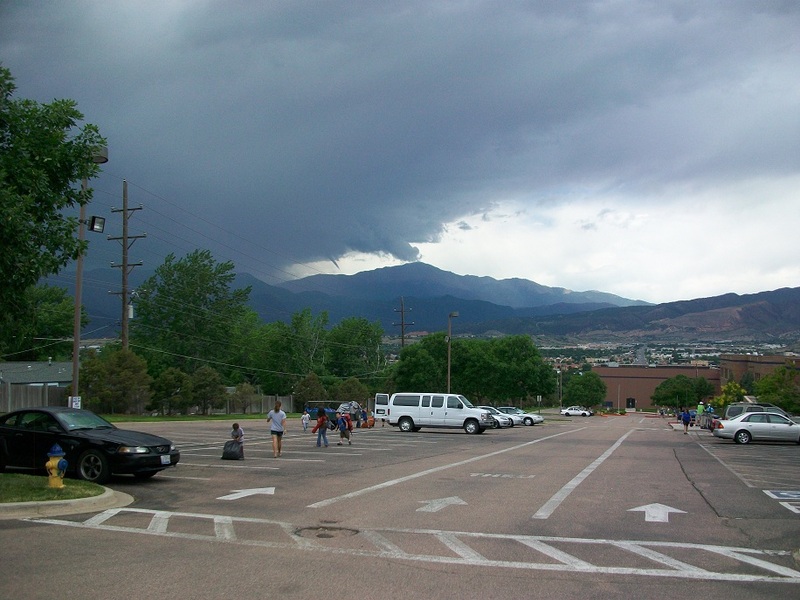 Here's the picture I took of Pikes Peak at about the time they were reaching the top. You can just barely see a funnel cloud that had formed just to the left of the peak. We've now finished one third of the ride. I've had a great time and met lots of great people and am looking forward to seeing more of this great and diverse continent. Unfortunately, several riders have left the tour today since they were only joining us for the first three weeks, including my riding and euchre buddies Joel and Christy. I rode almost every day with Shannon and Christy. Shannon lives in Kitchener and we met up a number of times before the tour for training rides. Shannon and Christy were roommates the opening weekend in Vanguard University and became instant BFFs. We often rode with others as well, but they tended to be much stronger riders, or weaker riders, so as often as not, we just rode with the three of us. Christy was fun and very out-going and a blast to ride with (even though she often made us stop for coffee and/or donuts), and she will be missed. Mike, congrats on finishing the first third! I've been enjoying the daily blog - and laughed out loud at the one-beer fall story! Congrats on 1/3 distance. Great pic getting that funnel on Pikes Peak, seen a few pics of it elsewhere, pretty rare sight that high. BTW, the climb up Pike's Peak is what critically wounded our Tiberon on the way out to California - our thermostat and cooling fan blew and our engine started smoking just as we made it to the checkpoint at around 10,000 feet... Melinda, disappointed, just said "Well, Doctor Quinn didn't make it up Pike's Peak on her first attempt either." It's certainly a sight to be seen, though, isn't it!